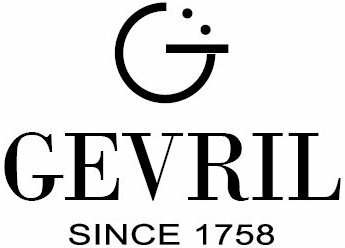 Like New York City, the Gevril Avenue of Americas Reference 5022 has plenty of international flair, steeped equally in artistic tradition and modern refinements. The Gevril watch captures the essence of the art deco period with its architecturally inspired motifs and bold, precise shapes. 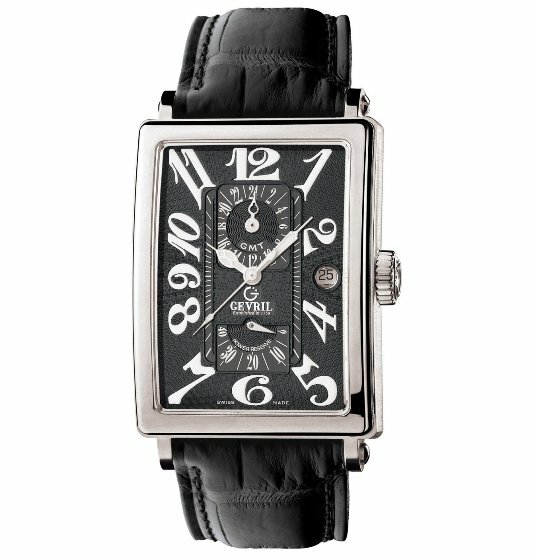 A clean combination of polished 316L stainless steel with black and silver dial elements is sophisticated and stylish. The prominent, geometric case is 44 mm long by 34 mm wide to ensure both wrist presence and a tailored look. For further comfort, the case is slightly curved so that the watch fits both small and large wrists with equal aplomb. From bold, scripted silver numerals to raised and recessed delineating lines between the sub-dials, the dial is a melting pot of textures. Other highlights include guilloche and an ornamental molding around the date window. The cathedral-style hands, coated in luminous paint, further the watch’s art deco appeal. In addition to refined styling, the 5022 – one of the models in the GMT Power Reserve Collection – is especially befitting of the business traveler. The watch has three complications: a GMT, a power-reserve indicator and a date display. The GMT allows the wearer to keep track of the time in a second time zone, usually home, while the central hands and date are set to the current location. To minimize the chance of the watch running down and stopping, the power-reserve indicates if it needs winding. The watch has a power reserve of 40 hours when fully wound. Driving the 5022 is Gevril’s 25-jewel, GV AOAX32 automatic movement consisting of a modified Soprod 9035 (base ETA 2892-2), with decorated bridges and a customized rotor that can be observed through the exhibition caseback, which is fastened by eight screws. Both the front and back crystals are made of scratch-resistant sapphire and the watch is water resistant to 160 feet. 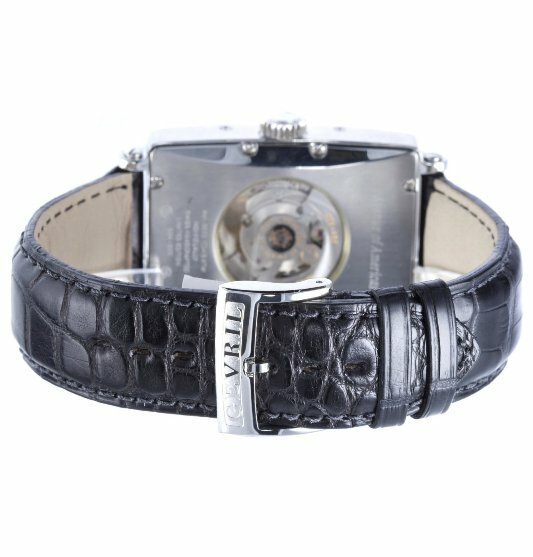 A black Louisiana crocodile-leather strap is an impeccable match, attached elegantly to the lugs with custom screws. 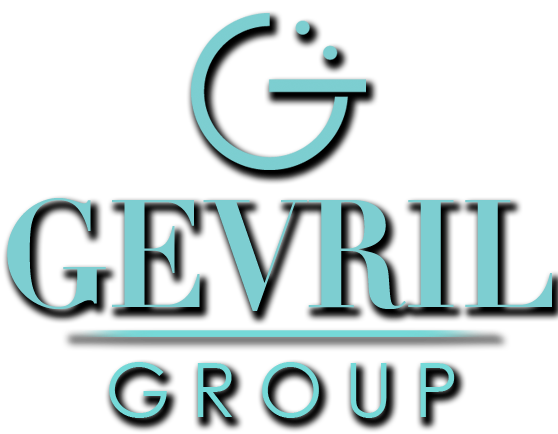 The tang-style buckle is personalized with the Gevril name. The Gevril Avenue of Americas Reference 5022 is limited to 500 pieces worldwide.